Découvrez la préparation des sauces dans toute leur subtilité, des plus simples aux plus sophistiquées, grâce au savoir-faire d’Éric Trochon, Meilleur Ouvrier de France depuis 2011. Éric Trochon propose LE livre de référence sur les sauces. Il y explique l’origine des recettes, les gestes et les techniques pour arriver au résultat le plus gourmand possible. Des incontournables (velouté, béchamel, hollandaise…) aux plus sophistiquées (Dugléré, zingara, cumberland…), chaque sauce est développée au travers d’un pas à pas. Transmission, pédagogie et excellence sont les maîtres-mots de cet ouvrage. Chaque cuisinier, qu’il soit amateur ou professionnel, saura trouver LA sauce la plus adaptée à chaque mets grâce aux conseils et astuces du chef. This is a reference book for sauces, created by Éric Trochon, the Best Worker in France. The uniqueness of French cuisine, and especially French gastronomy, is based on the key role that sauces play in the creation of dishes. French sauces are rich and varied and have become one of the most important pieces of savoir-faire in the world. This is knowledge that is passed down over generations, from chef to chef. 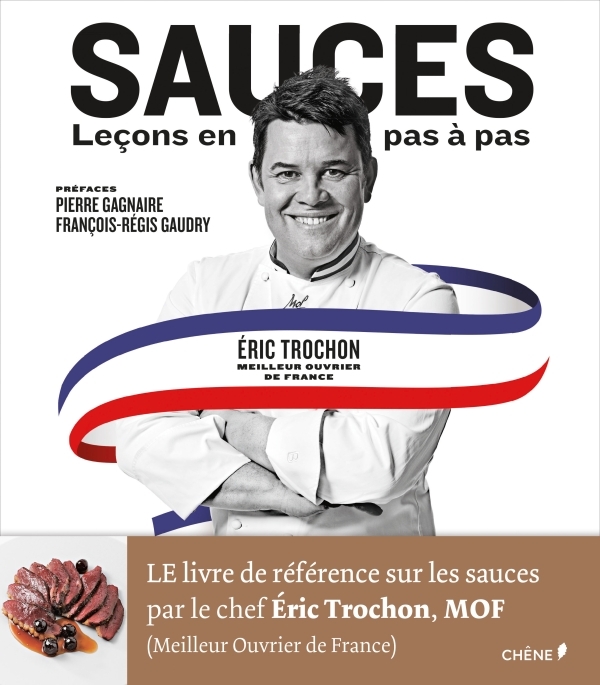 Whether they are sweet or savoury, hot or cold, Éric Trochon, MOF, has written a reference book for sauces that portrays a great respect for French tradition. It is a book that is aimed at passionate amateurs and strict professionals alike. From white butter aïoli and hollondaise sauce, to beurre suzette and custard sauce, this book provides you with all the tools you need to craft these little masterpieces to accompany any of your dishes. From the simplest to the most sophisticated sauces, 150 recipes and 3,000 step-by-step photographs are provided to guide you. Eric Trochon, who was born and is based in Paris, received the prestigious MOF (Meilleur Ouvrier de France or ‘Best Worker in France’) title in 2011. As someone who is dedicated to transmitting and sharing knowledge, he has taught at Ferrandi Culinary School in Paris for many years. As a renowned culinary stylist, he also contributed to many works about prestigious chefs (Paul Bocuse, Joël Robuchon, etc.) and has collaborated with famous photographs like Peter Lippman. Working with Éric Frénot, he created the first three volumes of recipes of the Meilleures recettes des Meilleurs Ouvriers de France (Best Recipes from the Best Workers in France) and founded the magazine 180°C, a real gem in the field of gastronomy.